Fresh produce, herbs and spices, healthy protein and fats, and cultured or fermented foods all go a long way toward strengthening the immune system so that it can fight off whatever comes its way. Unfortunately, once in a while a truly nasty bug comes along, and sickness is inevitable. What does the crunchy person do in this case? Go to the doctor and grudgingly submit to a course of gut-biome-destroying antibiotics? While they may be necessary in certain circumstances, there are also many holistic alternatives that are considered effective. Colloidal silver has long been used to fight the growth of bacteria and unwanted microorganisms — even the simple practice of dropping a silver coin into a jug of milk to prevent it from spoiling. Similarly, silver particles can be used to disinfect unsafe drinking water. It was used in antibiotic medications prior to the 1940s, when modern drugs became patented and popularized. Colloidal silver is simply distilled water with nanoparticles of silver added. It is created by placing strips of pure elemental silver into the water and applying a small electric current. The silver releases tiny particles into the water. This mixture can then be consumed, inhaled, used topically or as a suppository. Silver is naturally found in small amounts in soil and food, and when used in a concentrated solution it has many health benefits. Antibiotic: The most celebrated use of colloidal silver is as a natural antibiotic. One researcher documented that over 650 different disease-causing microorganisms could be destroyed within a short period of time thanks to exposure to tiny amounts of silver. More recent research has shown that it is even able to kill antibiotic-resistant bacteria such as MRSA (methicillin-resistant Staphylococcus aureus). The reason colloidal silver is so effective against bacteria is that it destroys important enzymes which protect the pathogens from oxidation. It is even able to specifically seek out bad bacteria because its electric charge attracts the negatively charged bacteria. For this application, colloidal silver can be consumed in an eyedropper, used in a neti pot, or sprayed directly into the nose. Topical uses: Colloidal silver can be used to stimulate the healing of skin conditions, wounds and infections. Try putting one or two drops into the eyes to treat pinkeye, apply two to five drops directly onto skin conditions and injuries, or use as a rinse for gum disease. Other conditions that can be helped include ringworm, thrush, psoriasis and eczema. Common infections: Since colloidal silver can destroy so many different types of bacteria, viruses and fungi, it is very effective against ear infections, which can be caused by unidentified microorganisms. Similarly, sinus infections caused by either bacteria or viruses can benefit from the inhalation of a colloidal silver spray. This may also help fight allergies and asthma. In addition, colloidal silver can be used on fungal infections. It can be applied directly to affected nails, or consumed orally with a spoonful of aloe vera, to fight candida yeast overgrowth. Viruses: Several serious viruses can be warded off by colloidal silver, including HIV, pneumonia, herpes, shingles, hepatitis and warts. This is particularly exciting because modern medicine has no solution for viruses. Immune boost: Many people swear by colloidal silver’s ability to fight the common cold and the flu. The metal disarms a wide range of disease-causing microorganisms and encourages the healing of inflamed tissues. It’s no surprise that hospitals use catheters and dressings that are impregnated with silver to prevent infection. Digestion: Colloidal silver is perfect for digestive conditions such as traveller’s diarrhea or food poisoning. For this purpose, most experts recommend swallowing a teaspoon of colloidal silver a few times a day. There are three types of colloidal silver, which are considered to be beneficial in varying degrees. Ionic silver is the least expensive to produce and only contains silver ions, not actual nanoparticles. Silver protein contains larger silver particles suspended in gelatin and water. These cheaper varieties are not considered as effective as true colloidal silver, which does not contain any additives and is labeled with a definite measurement of silver nanoparticles in milligrams per liter (mg/L) or parts per million (ppm). Experts recommend choosing a brand that contains 10 parts per million and has the smallest possible particle size. Many mainstream sources have popularized the notion that colloidal silver is dangerous. Natural health experts maintain that discounting its effectiveness is a way to protect the patents and profit interests of the pharmaceutical industry. A few cases of a serious side effect have been noted — prolonged use of large amounts of a crudely produced colloidal silver can result in a strange and rare condition called argyria, where the skin turns blue. Colloidal silver can also interact with prescription medications, and occasionally cause allergic reactions. This is why it’s important to purchase high-quality colloidal silver and use only small amounts for a limited length of time. Holistic physician Dr. Josh Axe recommends using just one to two drops for most applications, or a maximum of 10 drops in some cases. Daily use should never extend past 14 days. Popular natural health expert Sarah Ballantyne maintains that colloidal silver should not be swallowed, but rather should only be applied topically, or at most, used for gargling. Others suggest that the digestive system can be bypassed by nebulizing and inhaling colloidal silver, which can be achieved using a small spray bottle. This method allows the tiny silver particles to enter the lungs and go directly into the bloodstream. If you don’t have a nebulizer, it is recommended that you use a colloidal silver gel and rub it in the inside of your nose and towards the nasal cavity. After this, inhale quickly through your nose to activate the gel. Another way to encourage the silver particles to enter the bloodstream directly is to hold the liquid in the mouth and allow the ultra-thin tissues in the cheeks and gums to absorb the colloids. The safety of taking colloidal silver orally is a contested issue. Before you consider using colloidal silver, remember to consult a trusted practitioner to ensure that your personal situation and health are taken into account. Overall, colloidal silver presents an exciting potential alternative to the overuse of antibiotics, which is rampant in our society. Learn more about the dangers of antibiotics in this article. 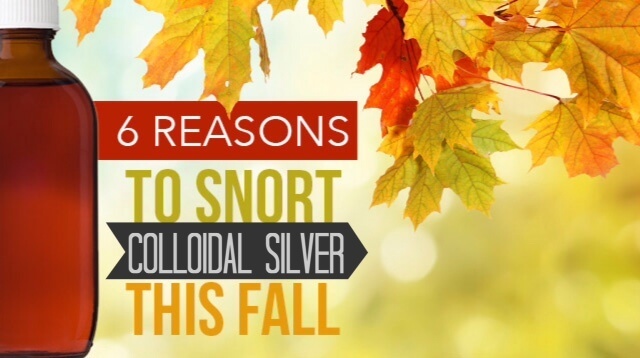 Hey Buddy!, I found this information for you: "6 Reasons to Snort Colloidal Silver This Fall". Here is the website link: https://www.thealternativedaily.com/reasons-to-snort-colloidal-silver/. Thank you.